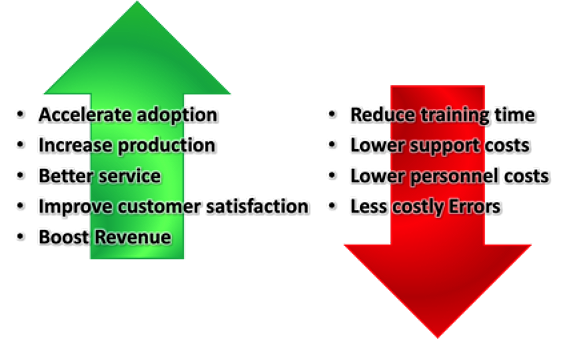 Business software development is always about the ROI and nowhere can this be better achieved than in the resulting end-user productivity. The premise is simple. Software that is easy, intuitive and productive to use accelerates software adoption, reduces learning curve, increases productivity and provides better service to your customers and other personnel. A Usable product is easy to learn, hard to forget, minimizes burden, reduces workload, anticipates and forgives mistakes, does what the user wants – when the user wants it, always provides feedback and is satisfying, perhaps even fun, to use. Users can find what they need, learn what else is there, use the tool to its fullest, do it all without help and leave feeling their time was well spent. Increases user adoption: A productive UX is faster and more gratifying to learn and use because it help users instead of getting in the way. Decreases user effort: A productive UX require less effort to use, allowing users to focus their energy on business. Increases user speed and quality: A productive UX helps users perform their common tasks faster, while at the same time decreasing the number of mistakes they make. Ongoing ROI: Developer productivity gains are great, but maximizing end-user productivity keeps giving and giving. 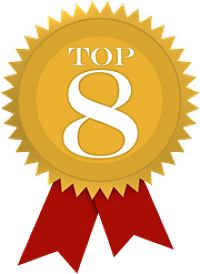 A great application helps users succeed in the easiest and fastest way possible. 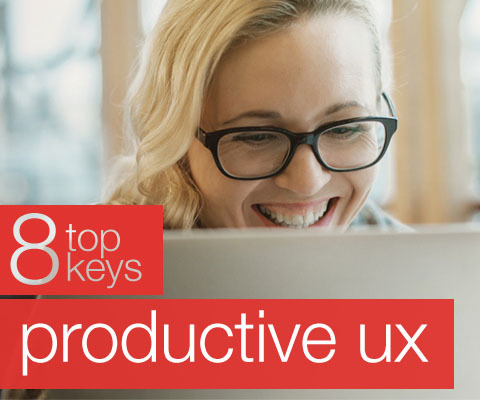 Surround has identified 8 Top Keys to a productive User Experience. Utilize these keys and you will unlock superior productive gains. The kind of productivity that transforms users into your competitive weapons. If you make software simple and intuitive to use, users can focus on the business at hand rather than the software to do it. Also, the ease of use of a system will directly correlate to how willing your users are to adopt it. If the system is simple to learn as well as to become even more advanced and efficient for users of all skill levels, they will innately desire to use the system, and advocate for others to use it as well. The application needs to excel in helping users complete complex and repetitive tasks quickly and easily. Once a particular task is learned easily despite the complexity of the business process, the user should be able to recall how to do it each and every time. If a system is designed to support memorability users can repeat what they did a few minutes, days, or weeks later. The application needs to enable the user to find the information or functionality they need easily and quickly? Navigating a system should come naturally to a user. When key components are placed in a natural setting users will find them fast and without much thought, and find the system familiar, and friendly. Good business solutions provide more than just the ability to find information or functionality, they also allow the user the ability to discover other relevant information and functionality. Basically, what ever information you are working with in the system, you should be able to see any additional relevant information. We sometimes refer to this as being able to “get anywhere from anywhere”. Get from a customer to an order to an invoice to a payment and back. The application needs to contribute to the user’s efficiency in a meaningful way. Also referred to as Time-To-Task, this is a measure of how long it takes a user to do a particular task or function. If you are recreating an existing system or creating one from scratch, proper or standard placement of components is key to speeding through a task at hand. Users have become accustomed to things “in their place”. Don’t fight the wave, ride it and get there faster. Errors cost time and money. The application needs to help users complete tasks without any errors. We also call this Task Competition. If components are where they are supposed to be then accuracy will follow. Minimize errors and provide active feedback so your users can know they are doing the right thing, or correct them before moving on. This is where the art meets the science and where simple things can often make large lasting impressions. A productive user experience is elegant and engaging. It is familiar, comfortable and pleasant to use for people of all skill levels. The application helps users achieve their immediate goals and motivates them to advance their skills and become even more efficient. A happy user is a happy business, and a happy business is a happy developer. Productivity is defined essentially as Corporate Revenues attained divided by the Number of Employees, so it yields a number. Within an Industry, companies compare theirs versus their competitors. Corporate America and its senior executives as well as the stock analysts look at these numbers very carefully. Software has had a positive effect on the productivity gains over the last decade or two and the emergence of mobile technologies has spiked that even further. Anyone in Software development must pay attention to these concepts, because, after all, it’s what the boss’ boss’ boss is thinking about.